Ice fishing in most New Hampshire lakes and ponds begins at “ice-in” and ends at “ice-out.” Depending on the weather and ice safety, this season can be from late December through mid-April. 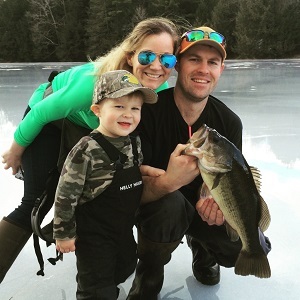 These types of waters support mostly warmwater fish populations, including perch, pickerel, black crappie and bass, with a few waters providing opportunities to catch brook, rainbow or brown trout through the ice. Waters managed for lake trout and/or salmon have a defined season of January 1 through March 31. Remember: salmon may not be taken through the ice. Designated trout ponds are closed to ice fishing. This is fun! Tyler Vaillancourt of Belmont, NH, with a 21" largemouth bass caught in a small NH pond. Photo courtesy of John Viar. QUESTION: How many ice fishing traps can be set per person? You are allowed only 2 traps (lines) when fishing "lake trout and salmon" lakes. Ice anglers are limited to 5 lines while ice fishing on NH-Maine border waters - except Great East Lake, which has a 2-line limit. Salmon and Brown Trout: Know the difference!